I’ve posted before on this and I clearly didn’t know what I was doing. I still don’t really know what I’m doing but I now have some pretty pictures and that’s all anybody really wants. In this post I’m going to import a postcode shapefile from the OS, plot the postcodes in R, find the neighbours of each postcode and convert the data into a network graph. Github repository here. 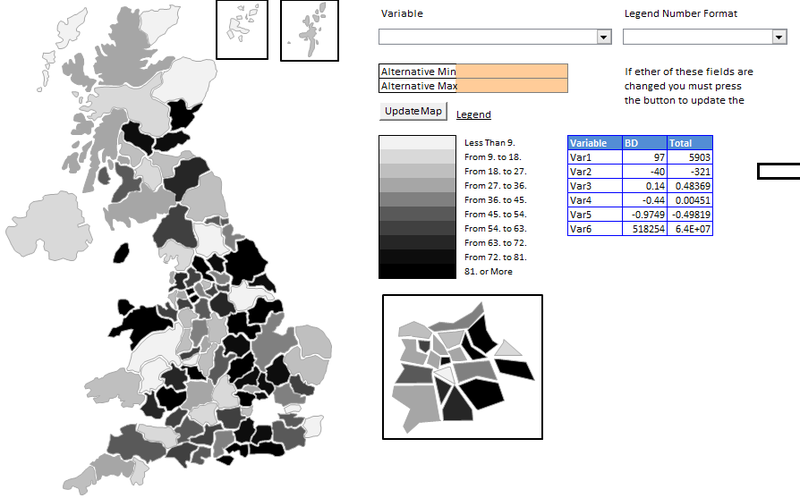 After my last post on the ONS data structure this post is the first of a few on using that structure and some other public data, mostly UK government data, and mapping it using R. This first post is about getting shapefiles from various locations, loading them into R and plotting them. I have been looking through the ONS geographic data on their Geo Portal and there are acronyms and variables everywhere so I thought it best to understand what they all mean. Whenever I refer to the output areas and super output areas I’m referring to the ones as at the 2011 census in England and Wales. I’ve been trying to improve my Excel choropleth map spreadsheet from my first post. The first thing I tried was to try to update it using some maps created on ClearlyandSimply.com. So I’ve created two new versions, one for Europe and one of the World. Both using the maps from ClearlyandSimply.com, with a few small alterations to the code so that on hovering over the map it tells you the country not the abbreviation. I did try to make my own UK maps of Constituency boundaries and Counties but using this technique but no matter how hard I tried I couldn’t get it to work. If you do get it to work, please let me know. Note that in both the Europe and World map the data may not be accurate and is only there for illustrative purposes. Following on from my previous post on creating a postcode file with the 2015 general election results I wanted to create a larger file with more variables. Some from the ONS lookups, others from different public datasets. The one I have added so far is the Office of Communications Broadband Coverage dataset from 2013. Over the past year I've been having a play mapping things in Excel, not the best tool for doing this I know but it does the trick. Mapping the data directly from Excel has the advantage that I've my data is already in Excel. I would like to do the same exercise in R but that's for another day once I get to know R better. The method I used is based on tips and methods used on Chandoo and Clear and Simply. Which looks pretty good to me.